A couple of months ago I shared the cover of Dream Eater by K. Bird Lincoln, and hosted a blog post by her. At the same time, I was also given an e-ARC of the book to read. Since the book releases today, I want to tell you how much I liked it. Koi is an endearing protagonist. Because making contact with anyone’s skin gives her nightmares, she lives her life without touching anyone. She is finally pursuing a life outside her apartment, though. She’s going back to college, she’s making conversation with the baristas at the coffee shop, and she’s determined that this time it’s going to stick. Only she hadn’t counted on evil college professors–like, literally evil, not just tough–and a hot guy with secrets of his own. She also hadn’t planned to get stuck taking care of her father, who suffers from dementia. That’s usually her sister’s responsibility, but family is family, and Koi can’t refuse. Koi’s father, the hot guy, and the evil college professor are all involved in some mystery that Koi can’t quite unravel. Mix in Japanese and Native American mythology, lots of shenanigans, and a healthy dose of Portland ambiance, and you’ve got a great series debut! I really enjoyed Dream Eater, and I’m definitely looking forward to the next book in the series. The pacing is fast, the characters are fun to spend time with, and Koi’s voice made me want to keep hanging out with her. While there’s one front-and-center conflict in this novel, there are also hints of an overarching conflict that will span the series, and I look forward to seeing how it develops. 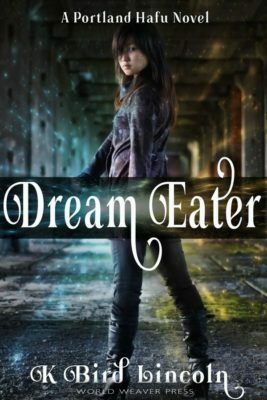 Any reader who enjoys Japanese mythology and anime will love Dream Eater. It will appeal to fans of C.E. Murphy and Patricia Briggs, and anyone who likes a smart, scrappy heroine who’s far from perfect but determined to do her best. Equus Table of Contents – Including Yours Truly!